My night didn’t start off that great. I was a bit tired, yes, but that’s not uncommon since I do often let DDO come before sleep. I joined a group for HoX and we went in on hard. Here’s what bothered me about it. 1. the person with the star wasn’t leading and didn’t even have voice. 2. things went south, and at least 3 people recalled (including the second healer – we were only 2). I’m incredibly stubborn and will fight until there’s nothing left to fight for. I was out of mana, but I started running around raising people with scrolls. We got mini beholders, then large beholders, bees and what ever you can think of. The beholders kept uncharming the puppies and people kept dying. Our tank stayed on mommy, while me and the ones still in, were running around killing beholders and renders. Or, I was mostly running around raising people and trying to throw a heal once in a while. I blame me. I tried, I know. I’m proud of my effort, but if I hadn’t died, I think we would have finished. I stayed in center with the beholders a little while too long, instead of running off, and died. The only one left was our tank. She, though, did a great job. Mommy had been made vulnerable already and our tank was beating on her like crazy. Got mommy down to 1% before she dropped. 😦 Meh. I didn’t want to go again, since I had spent a lot of scrolls and time on the quest, and didn’t feel like doing it again. I lfm’d for Running with the devils normal “a quick run for gs stone”, and got some people for it. Was a nice and quick run. Then I joined someone doing Weapons shipment elite. First time. We get to the second room/ area without any problems, then I quickly start getting annoyed. Group’s a barb, pally, wizard, fvs and bard. I don’t know what the wizard was doing, but he for some reason was meleing and kept dying. I told him to go shrine at least 3 times before he did. But he still kept dying and I didn’t want to raise him anymore. And then for some reason the fvs decides to pike in the shrine room. I’m running around with aggro from casters, trying to stay alive and raise. The fvs comes back, enters the area and I pick up 2 stones to take them to the shrine. The fvs follows, and it’s a fail. No one left in the same area as the NPC and it’s over. I’m so annoyed with both the wiz and the fvs that I don’t want to rerun. So finally I do my saturday elite shroud lfm. I get two healers I know from before, and a lot of dps. Seems good. But I get a halfling wizard named Herecomestrouble or something similar, who’s getting on my, and probably the other’s nerves as well starting with phase 2. He was throwing disco and sleet storm around, not listening and not communicating. Two things that I can’t stand (people not listening and not communicating). 🙂 Phase 2’s a bit messy, I belive we have 2 failed attempts before we manage to get the crystal, and I’m not aware that we were done, because I was trying to get people to listen to the basic rules. Then I felt sorta embarrassed that I was yelling out orders after we were done. Let’s blame lag, ok? Anywho, phase 3’s fine, phase 4’s a bit messy again, with some communication problems. And I die! 2 others die as well, but I’m the third to go down, and in my own raid. 😦 I’m pretty disappointed. Before phase 5 the wizard isn’t responsive, and doesn’t rest to get his mana back. I don’t know what’s up with him, but who cares? Phase 5 goes sort of smoothly, even though we have a few deaths. And I decide that I’m not gonna pot this time. I run out of mana close to the end, since I’m offensive casting (DoT’ing) as well the whole time, but I don’t pot, use a few scrolls, but let the fvs who still had mana do the healing just before the end. So yay! Thaz’s 14th shroud completion. 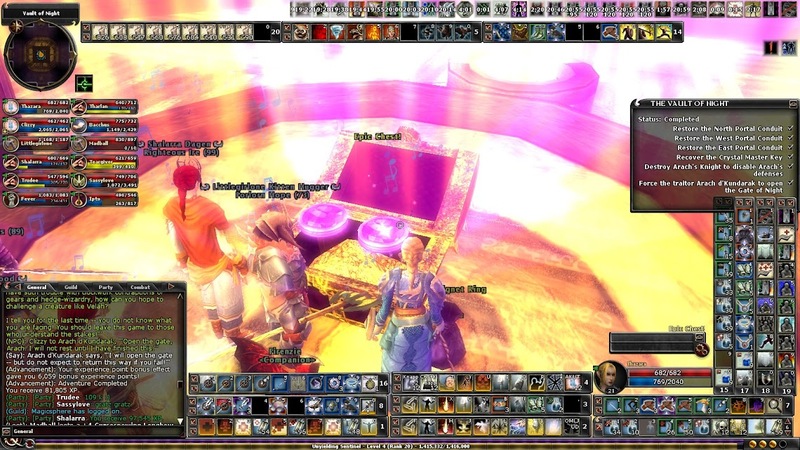 The fvs who dc’d earlier, he swaps to another of his toons and puts up an lfm for eVON hard (or he did have eVON5 normal, eVON6 hard, but I persuaded him to do eVON5 hard as well, lol), so me and a barb from Shroud join. I don’t know VON5. I haven’t counted how many times I’ve run it, fewer than Shroud anyway, and I don’t know all the objectives or where you’re supposed to go. I just follow the group and hope I don’t get lost. 🙂 Well we did well and I get 81,805 xp for eVON5 (my second run of it) and something like 39k for eVON6. I didn’t get any red devil scale, though. Then our leader swaps back to his fvs, or maybe it was another of them, and we decide to do hard eADQ1-2. This was my first time running eADQ. I manage to stay alive, even though I get hit by the traps in bat, and we do have a little bit of difficulties in some parts, but ADQ1 in maybe 40 minutes. Rebuff and then ADQ2. Now, fighting Queen Lailat I actually enjoy. 🙂 Thaz can actually stand and block, and just spam her with dp (I swapped to unbreakable stance with gives Thaz the die hard feat and dr10 epic). So, I was doing that. 🙂 A nice run and the xp got Thaz to Unyielding Sentinel 5. I activated Exalted Angel, and now Thaz only has 440 hp buffed 😦 When in US – Vigor of battle stance she has 640. I’ll likely swap back to US for my weekly elite Shroud, though. I was hoping to make Thaz a hp gs item before swapping to EA, but I didn’t even have enough stuff to make the blank 😦 meh. From where do you even get the stuff for the blank? Vale quests? Alright, that’s all from me for now. Tc and see you in game. Glad you had some good runs to make up for the poor weapon shipment one, personally I hate logging off with that bad taste of failure in my mouth. 🙂 Jup, the rest of the night was good then.